The members of the Nordic Swimming Federation (NSF) are the Danish Swimming Federation, the Faroe Islands Swimming Association, the Finnish Swimming Association, the Norwegian Swimming Federation, the Icelandic Swimming Association, the Swedish Swimming Federation and the Estonian Swimming Federation. The Nordic Swimming Federation is a collaborative body between the member federations. 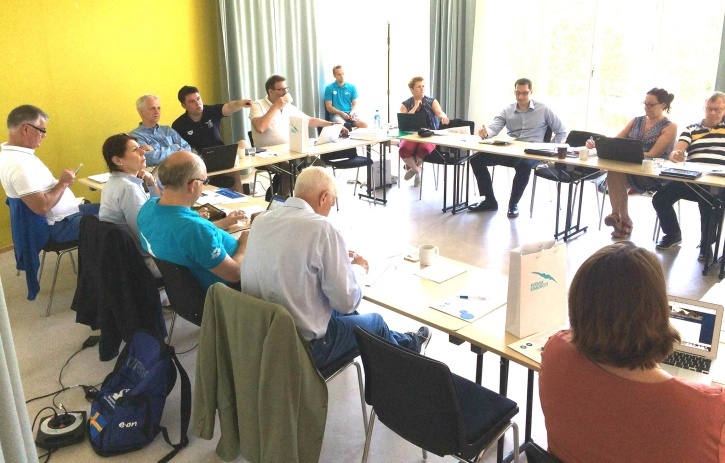 The main goal of the collaboration in the Nordic Swimming Federation is strengthening swimming as a sport in the Nordic region by planning and organizing Nordic Championships and competitions in different disciplines. 2) that members would have mutual understanding in international questions by sharing information and opinions in meetings or by email. The bodies of the federation are the congress and the federation board. Congress is the federation's highest body. Every member has one vote at meetings of the congress. The board consists of presidents from each of the member countries. The work of the board is chaired by the Chairperson. The Chairperson and secretariat are decided by the Congress every two years. The NSF rules are reviewed and confirmed on NSF Congress each year.